Things I Just Had To Know About Stephanie from Reading is Better with Cupcakes! Today we have Stephanie from Reading is Better with Cupcakes!! I am a 32 year old SAHM to a 1 year old little girl I commonly refer to as The Bug. Before this though, I spent about 6 years being a bookseller! My blog is actually almost 1 year old! It turns 1 in a month! Technically, no, this blog is not my first one. Once upon a time I created one called Crouton’s Crunchy Reviews but I never really did anything with it. I took the reviews I had posted on there and used them to jumpstart Reading is Better With Cupcakes and it has been smooth sailing since. I also love helping authors and publishers. I like being able to help them get the word out about their books and all things bookish. It was something I got to do a lot of working in a bookseller, planning events and what not and I thought that this would be a great way to continue to help them out! My blog name is actually inspired in part by my xbox gamertag: MurderByCupcake (feel free to add me!) I had to ask my friends to help me come up with a name though. One of them came up with Reading is Better With Cupcakes and I absolutely loved it! I honestly don’t know the answer to this. I never really paid attention to when people started hitting the follow button on my blog. So I made one and all the social media accounts. I already knew about Netgalley and Edelweiss from having been a bookseller so I had those already done. And then I just went with it. Sometimes I did some research via google to find an answer or something, but really I just wing it. 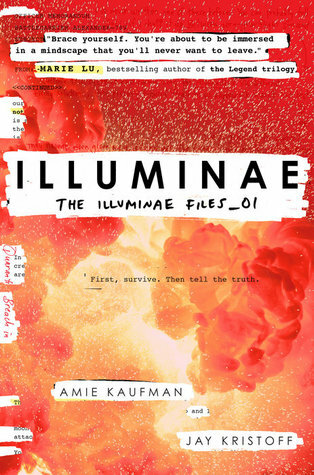 I finally read Illuminae last month and have been kicking myself for waiting so long to read it. It was amazing! Do what you want to do when you want to do it. But if you promise a date or time frame to someone – stick to that promise. They are counting on you. No I don’t think so. Not yet at least. But there are still some movies for books that I haven’t watched yet. Are there any popular books you know you would never read? Well….50 Shades of Grey I wont read. I also will not read Twilight. Nope nope nope. You can’t make me. No, I dont have any new ones in the works. I am just trying to keep focused on the ones I have. Some of them I have been really good about keeping up on and others I have only managed to post on a couple of times. So until I can do all of them on a consistent basis I don’t plan on adding any new ones. My child. My phone. My pants. Extra Diapers. Snack food for the kid. PS: Do you have any questions for Stephanie? ?